Apple’s recent trackpads and the company’s Magic Mouse stand out from the input-device crowd thanks to Multi-Touch functionality—one- or multi-finger gestures, such as pinching and swiping, that perform particular actions depending on the context. However, those gestures are few, and Mac OS X doesn’t provide a way to add more. That’s where Jitouch, which I first covered back in late 2009 but has been significantly updated since, comes in. This third-party System Preferences pane provides a slew of additional gestures, as well as the capability to create your own. While most gestures have a default action associated with them, you can edit any gesture to perform the specific action you desire. Action options run the gamut from switching tabs in your browser to to resizing a window to switching between Spaces workspaces. You can also configure a gesture to open a particular file or Website, or you can assign a simple keyboard shortcut to any gesture. Among my favorite actions are a pair that lets you quickly maximize windows to the right or left half of the screen, respectively. Each gesture can be configured either with a single function across all programs, or to perform different actions depending on the program. 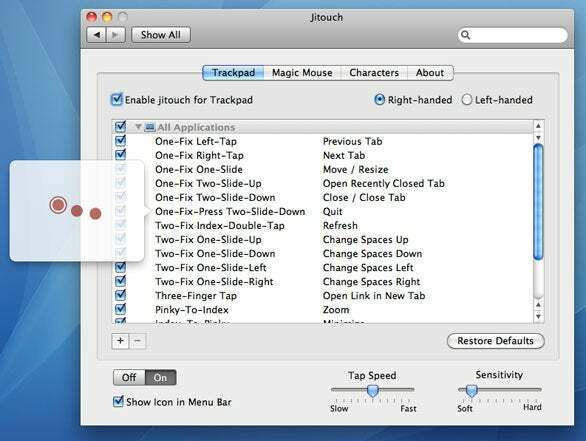 Jitouch’s other unique feature is that it lets you use, on a trackpad or a Magic Mouse, what the developer calls Character Gestures. Instead of having to remember complicated two-, three-, or four-finger gestures, you can assign actions to simple, finger-drawn characters. Just “draw” the character—on a trackpad, using the combination of your index and ring fingers, or with the Magic Mouse, by moving the mouse while pressing with your index and middle fingers—and the character will actually appear on the screen, followed by the corresponding action being performed. In my testing, Jitouch’s biggest drawback is that it provides so many different gestures, and all of those gestures are enabled by default. I recommend disabling all but a few gestures until you get the hang of them, and then gradually adding more until you reach the limit of your personal dexterity and gesture memory.